Bonnie Olson sent the above picture to me. She has finished her Raven Bewitched (one of our newest cross stitch patterns) and framed it on this old scrub board. Isn't this a great way to frame this piece? 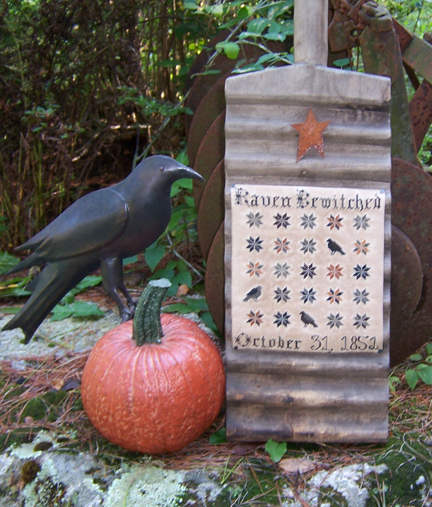 Bonnie writes..."I just finished walnut staining and pressing Raven Bewitched. Thought you might like to see it. I used 48 ct. linen and the DMC floss colors. I did change 2 colors,779-used 975 and for 3860-used 3826. I needed orange in it! The sampler is 6 1/2" wide x 7 3/8" high. I'm going to try and find an old bread board at an antique shop. Maybe paint it black and tack the piece onto it and hang it." After pressing and staining the piece. Bonnie changed her mind about the bread board framing...she found an old scrub board she had forgotten she had. The bottom had rotted years ago, so she had her husband cut about 12" off where it was bad. Love the framing idea. It's perfect! Don't we all wish we could go down to the basement and find something that wonderful? Until later dear friends! Hope your weather is wonderful as it is here in the midwest! what an interesting finish. I love it. Beautifully done and just the sweetest primitive touch! Go Bonnie! Great way to finish that piece! I love it! What a wonderful piece...love the creative framing! A perfect finish for this piece! Very clever. LOVE the framing idea!! Gonna take a look in the basement and garage for creative inspiration! p.s. the weather here in the burgh...lot of ark building being contemplated...looks better the rest of the week though. I keep telling Bonnie she needs to start a blog with all her stitching! Great stitcher and wonderful creative finishes!! This one is great!! I like the orange she added..
A fabulous finishing idea! Love it! Love the piece, and love the finish!! It's just wonderful! That is just a great idea! After just cleaning out my parent's house, I am now rethinking her pastry board; hmmm. That is just beautiful !! I would love to lnwo how she does walnut staining, never saw how that is doing. I wish therewas a tutorial for it. It's finishes like this that make blogging so very, very interesting. Love the pattern. What a creative way to frame a piece of stitchery! And I love the raven. Thanks for sharing! Love the piece, and the touch of orange. Great finish!! Oh that is so pretty - what a great piece of inspiration! Does the year 1851 have any special meaning ? The touch of orange is a great idea !